There’s a variety of things that can be done to show someone they’ve done an exceptional job at something. Mother’s may write their children a note telling them how proud they are that they’ve made the Dean’s List while Elementary school teachers always reward their students with a sticker or golden star. However, when honor is achieved and recognition is due there’s nothing that beats a keepsake item to commiserate the occasion. 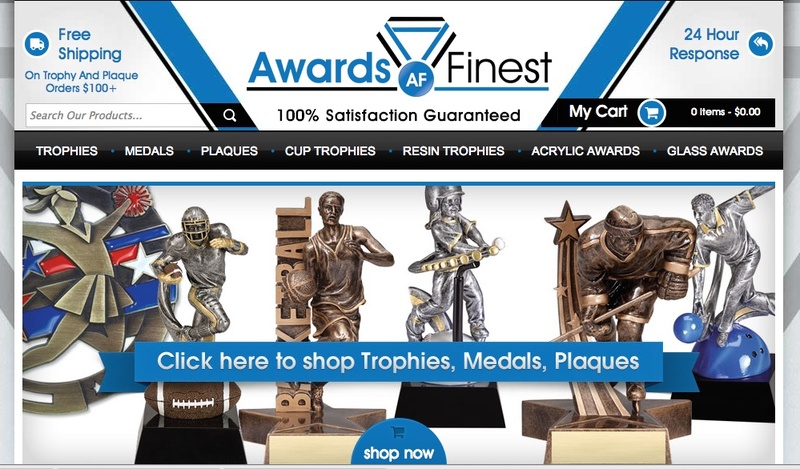 Awards Finest, an commerce shop dedicated to trophies, medals and plaques, has taken on an award winning look of their own. The BigCommerce shop teamed up with OC Designs Online for a classic look that makes shopping rewarding and fun. The welcome pane and header of this shop design grabs your attention with the white, blue and charcoal grey layout. Two blue and black columns reach from the charcoal grey panel to mimic an award ribbon hanging from the shop. 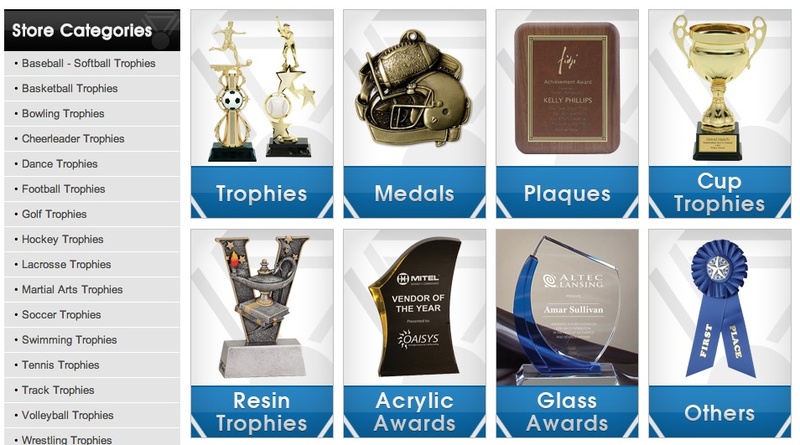 The grey panel hosts tabs for store categories such as acrylic awards, glass awards, and cup trophies. The store logo sits between the ribbons along with a satisfaction guarantee beneath it to assure online shoppers they’re come to the right store! In the far left hand and right hand corner two perks with shopping at Awards Finest can be seen as well. Free shipping and 24 hour response are just two reasons why the shop has exceptional customer service. Dance, soccer, and tennis are just a few of the extracurricular activities one can excel at and each are highlighted along the left hand side of this midsection. The midsection has a store category column along the left hand side of the page to make finding trophies easy for any sport. Neighboring the column and to the right online shoppers can view an image of the different categories and items offered within the award shop. The shop layout suits customers with a specific award in mind but also assists shoppers who may want to browse a bit with visuals and category titles. The footer of this BigCommerce store design spotlights different trophies with a Featured Product section. Store inventory can rotate through this section along with an easy purchase tab at the bottom to make checking out easy and quick! Also, customers can’t overlook the newsletter sign-up tab to the left. Once a customer signs up for the shop newsletter they’re able to view store discounts, sales and be the first to hear about new inventory. Take a moment to browse our portfolio and request a free quote. We have a feeling you’ll love what you see! Don’t forget to find us on Facebook, follow us on Twitter and check out our Google+ Page too!